Nsuk Gist: How Long Will The NSUK Strike Last? How Long Will The NSUK Strike Last? If there is anything that can be as certain as death, it is the notorious fact that no Nigeria university student will graduate within the timeline of his programme without witnessing ASUU strike- a sort of baptism of fire for the new initiates. The incessant and intractable confrontation between the Academic Staff Union of Universities and government is always on hand to extend his stay in the University, at least for six months. Today ASUU has earned for itself, rightly or wrongly “enemy of progress” owing to its penchant to down tooling each time it has issues to grind with authorities. Presently at Nasarawa State University, Keffi, the students “are not smiling”. In fact, they are furious. Many of them don’t even know what the issue at stake is, warranting them to channel their anger indiscriminately. They will blame anybody for strike, even my humble self for not stopping ASUU...! “ASUU is selfish. All they know is strike, strike, strike...”, some would say while others turned their anger on the university management and queried: “what are they doing with our school fees? They should pay them now and let us graduate”, they fumed. More would vent their frustration on Buhari’s government, “shey una wanted change, see where it gots. APC is not ready for governance”, as if Al-Makura just got elected yesterday. While the rage is going on, the strike is dragging and today is day 3 and still counting. As at the last time we spoke with ASUU chairman, NSUK branch, Dr. Theophilous Lagi, he said “no effort has been made by government toward resolving the issues that caused the strike”. And with our past experience it is probably too early to be hopeful and those who are expecting a miraculous turn of event should rather not be too expectant as the process that leads to ending a strike, once started, is rigorous, tortuous and frustrating. The ASUU chairman knows the intricacies so well hence he gave the warning. He told us then that the ultimate decision to embark on strike will be decided by the National Executive Committee of ASUU. “Nothing is dependent on us. We have to wait for the outcome of the mandate that will be given to us by the NEC of ASUU to close down the university”, he said. That mandate they got at the NEC meeting held at the Usman Danfodiyo University, Sokoto between 13th and 14th February, 2016. The mandate said: “NEC granted the branch (NSUK) permission to embark on a total and indefinite strike action effective three weeks from February 14, 2016 if all the interventions going on fail to address the outstanding issues”. 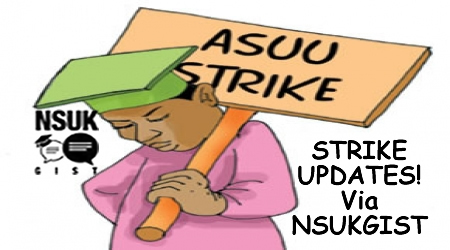 The ultimatum expired last Monday when ASUU decided to embark on “comprehensive, total and indefinite strike” after the intervention by stakeholders, including the state House of Assembly, failed to yield result. A professor and member of ASUU in NSUK who is not authorized to speak for the union told us that “this is the first time three strong adjectives are being used: ‘comprehensive, total and indefinite’. I foresee this strike lasting for at least a month and that is because I don’t want to upset the students otherwise we may be looking at 3 months minimum”, he said. According to him, the process of ending a strike once started will follow the same process that led to it. “Even if all the demands are met today, the branch will convene a congress where they will agree on whether to call off the strike or not. If they agree, they will have to inform the NEC who will at the also give approval to that effect”, the Professor said. "Don't forget that another congress will be called by the branch to rectify the NEC's mandate", he added. In effect, the mandate of the NEC must be sort before calling off the strike thereby following similar procedure that led to it in the first place. It is also important to know that they will be series of negotiation and re-negotiation that may be accepted or rejected. All of this will determine the length and duration of the strike. ation was "comprehensive, total and indefinite", our suspicion is that it may stretch longer than anticipated if nothing is done immediately to nip it in the bud before days turns to weeks and then to months. For the meantime, like always, it is a battle between two elephants and certainly none of the combatants will feel the impact, at least not directly. Of course the lecturers will receive their salaries, even for the period of the strike, without any deduction. And government will go on as if nothing happened. What will the students get? The students will never take back the lost period. For the students who are used to this squabble, here we go again. For the new students who never experienced one, welcome aboard. It is going to be a long ride before you graduate.